Half hardy, bushy, rigid, evergreen shrub with very small, smooth, scale-like leaves, and terminal heads of white, crimson, rose or purple flowers in summer. To 60cm. [RHSD, Rice]. ‘Being in blossom during almost the whole of the year, and in growth and appearance extremely elegant; it is one of the most ornamental plants we have. The flowers of this, and many others of the same family, if cut off when fully open, and kept dry, will retain their form and brilliance a great many years.’ [LBC no.8, 1817]. ‘The beauty of the flowers, in the general sense of the word, consists in the whole genus in the rays of the Calyx, which are persistent and variously coloured. In the present species the rays are of a bright crimson, especially on the outside, on which account, their brilliancy is seen to the greatest advantage before the flower is fully expanded. […] Introduced in 1789.’ [BM t.2365/1822]. BR f.21/1815. Listed in the 1850 and 1857 catalogues [H.111/1850]. 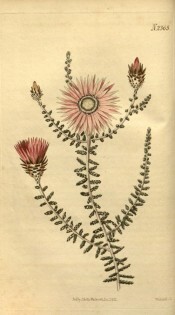 It may have been obtained from the London Horticultural Society. It was included among desiderata in a letter to John Lindley, 15th February 1848, but not recorded as ‘arrived’ in Macarthur’s copy [MP A2933-1, p.157]. 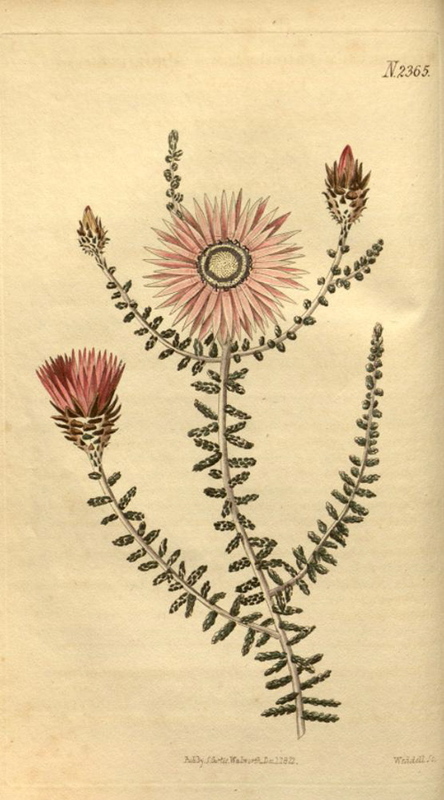 It was also requested of Kew Gardens at about the same time under the name Phaenocoma proliferum [MP A2933-1, p.165]. It was requested again of Kew on 1st February, 1849 [MP A2933-1, p.177].